Sure, anyone with a calendar (advent or otherwise) could count the days, but there are other ways to confirm the holidays have arrived. Here are just 10 signs that suggest you’ve entered the most wonderful time of the year. So grab an eggnog and a gingerbread cookie for the scroll and dig in. 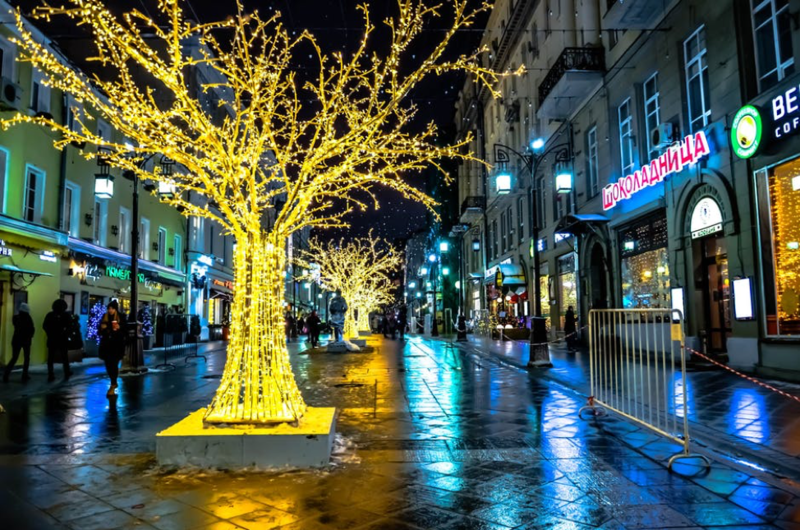 If you’re willing to brave the brisk winds by walking downtown, you’ll notice the street lamps and other city-owned property will show off their best holiday decorations. Private businesses will join in on the fun to create a magical scene with window displays and other decorations. Rife with controversy, the Starbucks’ red cup represents a “war on Christmas” for the tiny, misinformed minority of white trash. For everyone else, it signals the winter holidays are on their way and the peppermint mocha is back on the menu. Now that’s what we call a win-win. The big man himself sets up shop as early as the Thanksgiving weekend in November if you visit Marcy’s in NY. Check your local mall’s schedule to confirm when you’ll see Santa in your neck of the woods. A Charlie Brown Christmas, Rudolph the Red-Nosed Reindeer, How the Grinch Stole Christmas, and any number of Hallmark originals play constantly on the TV during the holidays. They’re joined by Love Actually, Elf, A Miracle on 34th street, and even Die Hard as classic Christmas movies we all love to watch and re-watch each year. Your community’s event calendar is a great litmus test of the season. Once Christmas bizarres, festivals, bake sales, and fairs take over the weekends, it’s a sign you need to start shopping. Whether or not you want them, the holidays bring with them colder temperatures and the promise of snow. Little ones will be checking the forecast obsessively to see if they’ll get a white Christmas this year. Much like the Weather Network is your gauge for the day’s highs, your friend’s iPhone decal is the barometer of the season. No fashionable person would let an iPhone skin stay the same for too long, even if it’s made from premium 3M vinyl like the decals from dbrand. They need some variety to keep things interesting, and your friend never fails to find an excuse to show off the coolest iPhone skins on the market. While they may have exchanged the summer’s black camo for an orange carbon fiber iPhone skin in the fall, they usually fall back to a classic red and green motif for the holidays. Once you see this familiar iPhone skin wrapped around their handset, you know it’s Christmas. As the winner of the sixth season of The Great British Bake Off, Nadiya Hussain knows her bread from her biscuits. People all over the world will look to Hussain and other famous bakers for inspiration this holiday as they take to their kitchens. Consumption of gingerbread, shortbread, and sugar cookies skyrocket during the holidays, and someone has to make them all! You might as well be the one to impress loved ones with these recipes. The fall’s symbolic scent is the pumpkin spiced latte. Its reign is fast and furious, landing between September and November, after which it’s replaced by the scents of the holidays. The smells of cranberry, gingerbread, pomegranate, spiced fig, pine, and spiced orange suffuse the air now that stores like Yankee Candle and Bath and Body Works have released their seasonal items. It doesn’t matter if you’re in the mall’s food court taking a break from shopping or skating through an outdoor ice rink. Most public spaces pump Christmas carols over the airwaves as a way to embrace the holiday spirit. The closer you get, the more often you’ll hear the same songs. Some signs are subtle. Some signs are as obvious as a 12-foot Christmas tree bent in a 9-foot room. Though they may differ, each sign announces the holidays are not just on their way but have arrived! Make sure you heed them. They act as your wake-up call to start shopping and baking, so you can be ready to make merry when the big day comes.